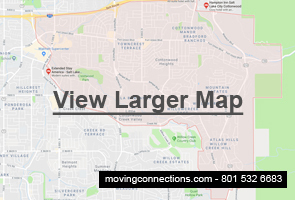 We at Moving Connections strive to make every Cottonwood Heights move worry-free. That’s why we select our personnel only from experienced movers, not from temp work agencies. Our moving crews are full-time moving professionals who know how to get the job done and get it done right. That’s why we offer a seamless door-to-door relocation service for your Cottonwood Heights move. And being professionals, Moving Connections is insured, bonded, and federally licensed. And we’ve been working in northern Utah for three decades. So we know that Cottonwood Heights families want a service-oriented moving company that will respect their valued items and will take utmost care in seeing that they arrive safely at their new home. If Moving Connections is moving you to Cottonwood Heights it's a perfect time to begin to utilize the many resources and bounties of Cottonwood Heights. For example click on the picture to the left to go the Moving Connections 'Support - Advice - Assistance' page and discover Cottonwood Heights for the first time. Once you are on the 'Support - Advice - Assistance' page go ahead and open the .pdf link found there and tape the list of emergency and useful phone numbers on your refrigerator. Moving Connections has gone to great pains to find those links and connections to integrate you quickly into Cottonwood Heights life.